This is one of those cases where a hosta has been known for a number of years under one name but evidence arises that it was named something else at an earlier date. That earlier name takes precedence when it comes to plant names. From the Field Guide to Hostas by Mark Zilis (2014), this cultivar was "registered as the cultivar 'On Stage' in 1986 by Paul Aden...but 'Chōkō Nishiki' is now recognized as the correct name." 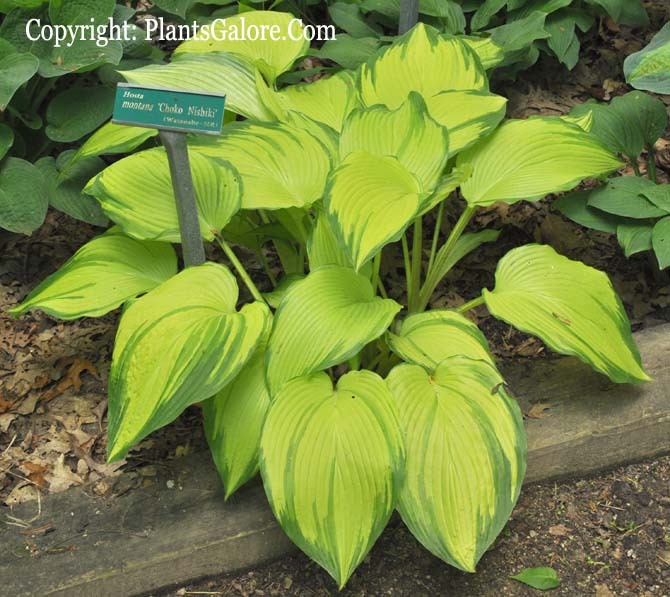 This slow growing sport of H. montana (Mount Fuji-type) was originated in Japan and registered by Mark Zilis of Illinois and The American Hosta Society in 2012. It is a large size plant about 22 inches high with a spread of around 48 inches. The leaves medium green with a yellow medial (center) variegation which has some streaks in it. They have thick substance and are moderately wavy, slightly corrugated and dull on top. Pale lavender, tubular flowers with lighter lavender margins bloom in July. The foliage on this plant emerges golden yellow in the center but turns green by mid-summer. It emerges 2 or 3 weeks later in the spring than forms of H. montana that come from other areas of Japan. This may help them to avoid damage by late season frosts like other types from this species. According to The Hostapedia by Mark Zilis (2009), "...one of the last cultivars to emerge in spring, making it less susceptible to frost in southern growing areas. It has been marketed in the U.S. under the name 'On Stage'." 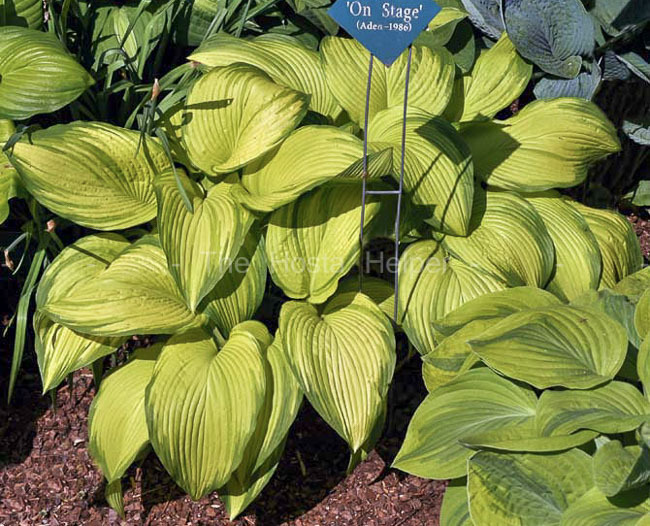 The 2013 Registrations report of The American Hosta Society stated: "The 2012 report credited "Asami" as the originator of H. 'On Stage", with a note that 'On Stage' is the same hosta as 'Chōkō Nishiki'. Originator of 'Chōkō Nishiki' was possibly thought to be Mr. Hisatoyo Asami of Tokyo, a long-time member of The American Hosta Society. An inquiry to Mr. Hisatoyo Asami determined that though he purchased the hosta around 1980, he was not its discoverer or originator. Furthermore, Mr. Asami does not know who named it." "H. ‘Chōkō Nishiki’ (2012) – This was registered with the following provenance and typographic error: Hisatoyo Asami (ON), Goetmba Nursery (I), M. Zilis, AHS (R). Further research has disclosed that the provenance should be: unknown (ON), Gotemba Nursery (I), M. Zilis, AHS (R)."